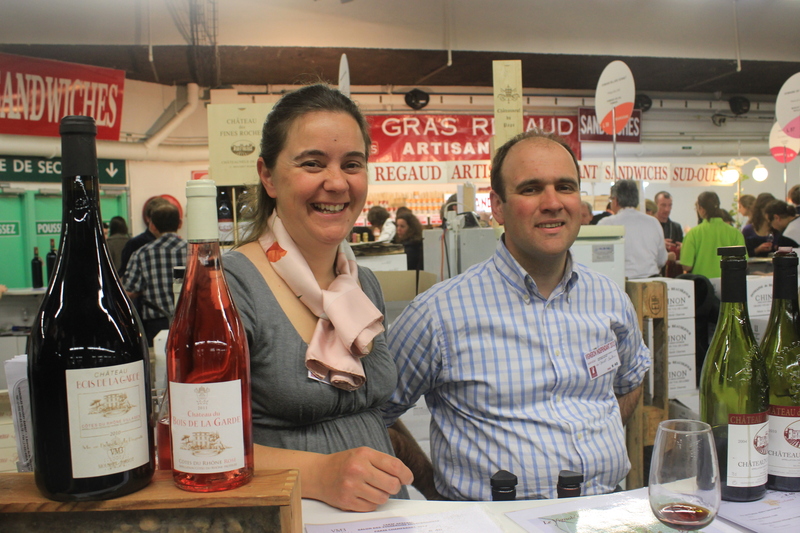 Vignerons Indépendants (http://www.vigneron-independant.com/) is a network of independent winemakers who are present in France through eleven regional federations. Their aim is to produce authentic wine with personality and the process that brings the winemakers to this result is protected by a Charter of thirteen principles. To show a potential consumer that this is serious business that gives a guarantee of quality, the network puts its logo on each bottle they produce. 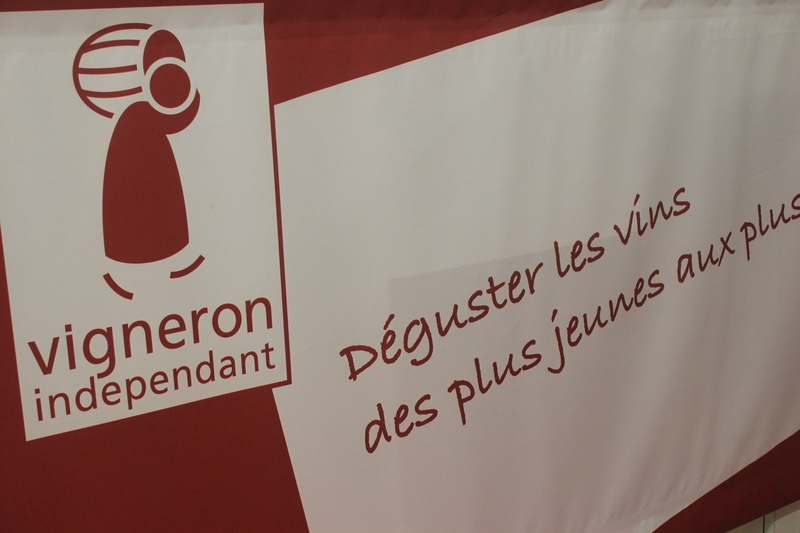 For example, we buy wine in Paris at our caviste who is specialized in the wines of independent winemakers, but if we need to buy wine elsewhere, we try to look for bottles with this logo as it most probably increases our satisfaction level (and contributes to the sustainable development of viticulture). Vignobles Mousset-Barrot (http://www.vmb.fr/) is a family business that has vines growing around three château in the southern Rhone Valley of France. Grapes that grow near Château des Fines Roches and Château Jas de Bressy make red and white wine and fall under the appellation of Châteauneuf-du-Pape AOC. 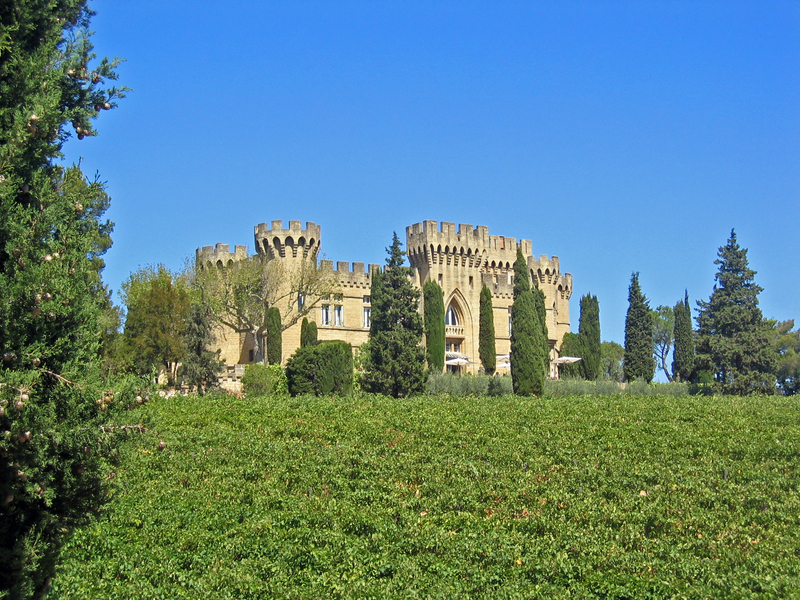 Château du Bois de la Garde produces all three colors but in terms of the appellation we are no longer longer talking about Châteauneuf-du-pape but Vin de pays de Méditerranée, Côtes du Rhône and Côtes du Rhône Villages. 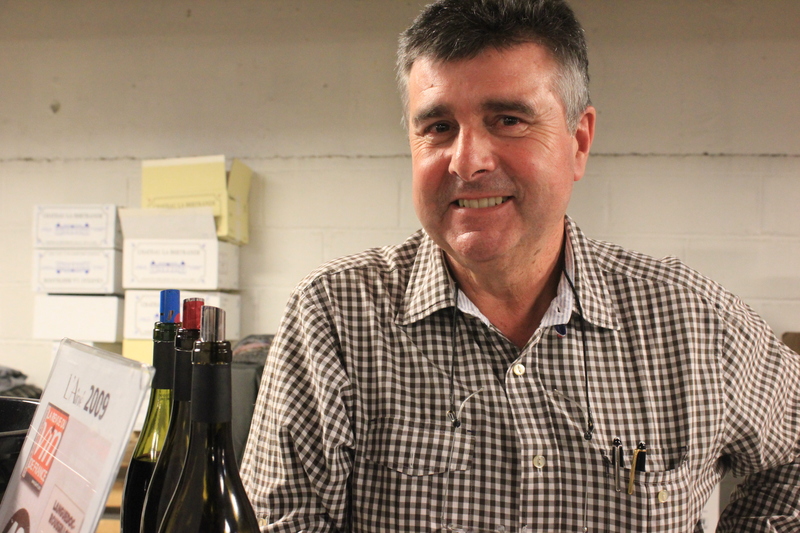 A common factor between all of these wines is that they grow around Châteauneuf-du-Pape, which is not only a world-famous appellation d’origine contrôlée (AOC) but also a small town near Avignon. Its history is intertwined with the Popes: in the 14th century the Popes temporarily lived in Avignon and were big supporters of the wine produced in the region. We were particularly interested in AOC Châteauneuf-du-pape Château des Fines Roches, because a few summers ago we had a superb lunch at this château (www. chateaufinesroches.com) that overlooks the vineyards. After a pleasant tasting of several reds, we ended up buying a 16.50€ bottle of red from 2010 (http://www.vmb.fr/sites/default/files/FR_roug.pdf) that goes perfectly with saucy game meat, like wild boar or rabbit stew. The next time we are in the region, we will definitely try to stop at Château Jas de Bressy, where the Vignobles Mousset-Barrot wines are stored and sold (http://vmb.fr/en/access-map). From Châteauneuf-du-Pape in the Rhone Valley we moved towards the French Mediterranean and a seaside town called Bandol. We know the region quite well, and many long lunches, and even longer dinners have been enjoyed in that region and in the company of une bouteille de rosé. Moreover, a few years ago we were invited to a wedding in a private island (owned by Paul Ricard) called l’Île de Bendor (www.bendor.com), ovelooking Bandol. 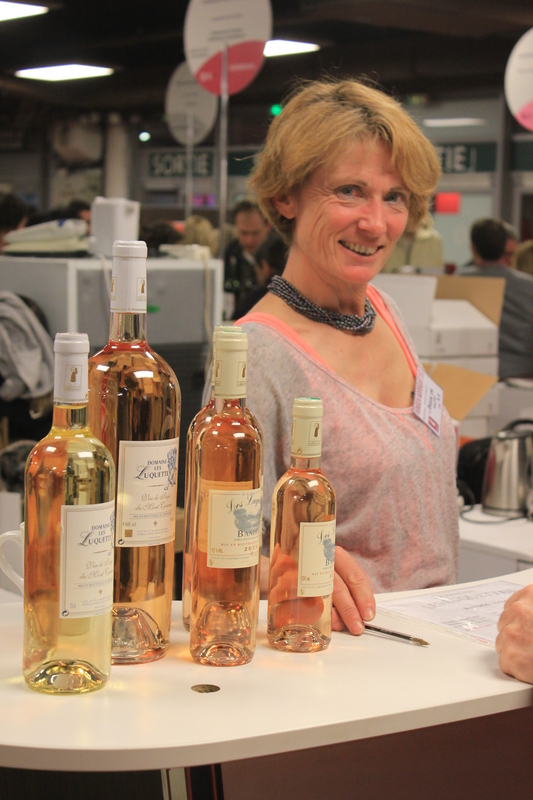 So when Elisabeth Lafourcade, the owner-manager (propriétaire récoltante) of Domaine Les Luquettes (http://www.les-luquettes.com) smiled at us as we were walking by, we didn’t hesitate to stop at her stand. Before we realized, we were tasting their different wines while listening to a crash course to wine history of the region. 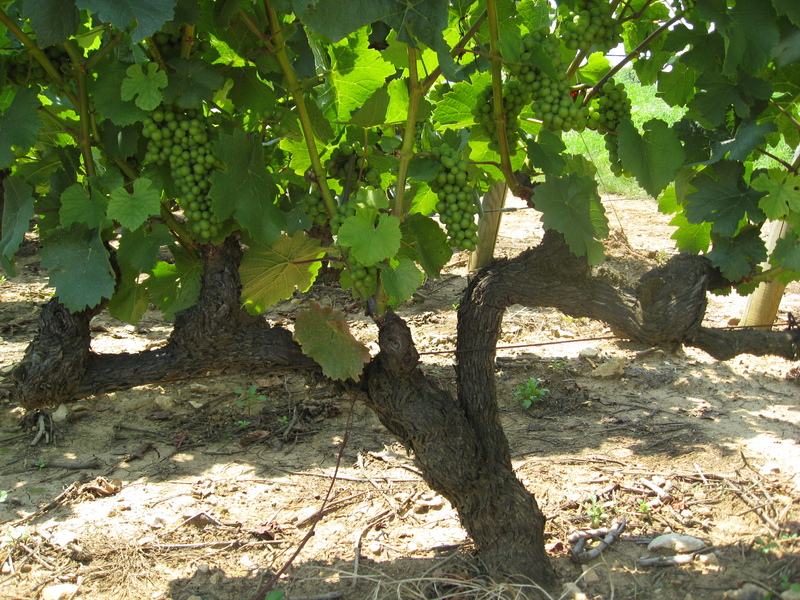 We learned that in 600 BC Ionian Greeks from Phocaea planted the first vines in the region. When Romans arrived less than 400 years later, they found vineyards doing very well; so well that the wine was ready to be exported, and this is exactly what the Romans started doing. 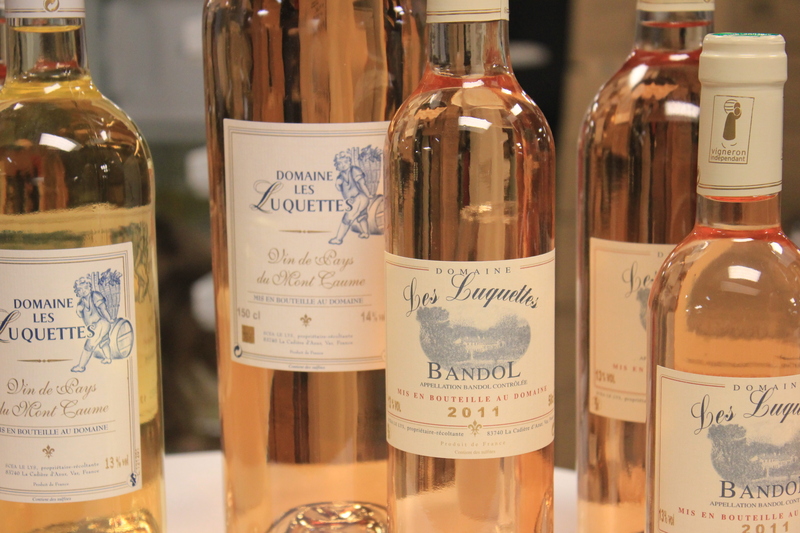 Originally Bandol was famous for its red, and the rosé came later. Because of its history, geographical location and centuries-old tradition, the Bandol wine has become so special that it was one of the first wines to receive its own appellation (AOC Bandol) in 1941 (http://www.vinsdebandol.com/aoc/decret-du-11-novembre-1941/?lang=en). Wine-making history at Domaine Les Luquettes goes back generations; their cellar was built in 1852. Today their two primary appellations are Bandol (AOC) and Mont-Caume (VDP). 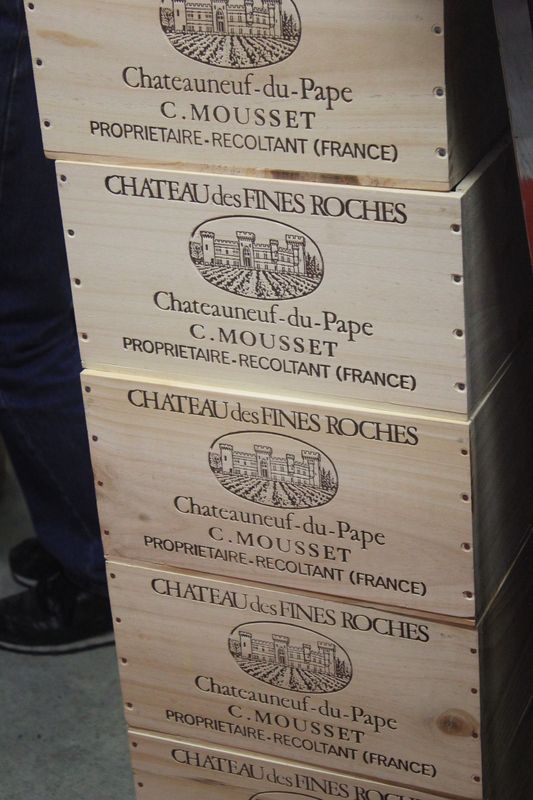 In 1997 the first bottles of Domaine Les Luquettes were released and today they are exported to Canada and the UK. Optimists as we are, we decided that the sun will soon start shining in Paris and we can start enjoying our new balcony, so we bought two (rosé) bottles of Vin de Pays du Mont Caume for 6€ per bottle. Now the only thing missing is the temperature to reach at least 15C (and preferably 20C…)! At Clos des Augustins (http://www.closdesaugustins.com), located some 20km North of Montpellier, the vines are grown according to organic methods; “reasonable culture” (culture « raisonnable ») as the owners call it. In 2004 they decided to go even further to show their commitment and respect of nature: biodynamic viticulture was introduced. But what does biodynamic viticulture mean? The father of the biodynamic agriculture is an Austrian philosopher Rudolf Steiner who suggested that the nature should be seen from a spiritual and philosophical perspective as well. In my own simplistic words, I say that he wanted us to see the nature beyond green leaves and black soil –to realize that there are forces beyond our knowledge and no matter how much medicine we give to a sick plant, it won’t work unless we do it in respect of these spiritual forces living in the nature. http://www.boissetfamilyestates.com/press/FortuneBiodynamics.pdf) The owner, Roger Mezy, offered us to taste all three colors produced by Clos des Augustins. In terms of the appellation, we were now talking about Pic Saint Loup (AOC), Val de Montferrand (VDP) and Coteaux du Languedoc (AOC). Our bags were already very heavy but white wine was something we had not yet bought, so we purchased two bottles of “vin de copains” (something to be drunk with friends): Les Bambins Clos des Augustins, Vin de Pays du Val de Montferrand (2011). We paid 8.50€ per bottle and the bottles are in the fridge waiting for maybe a fish dish, or simply for friends to come over! 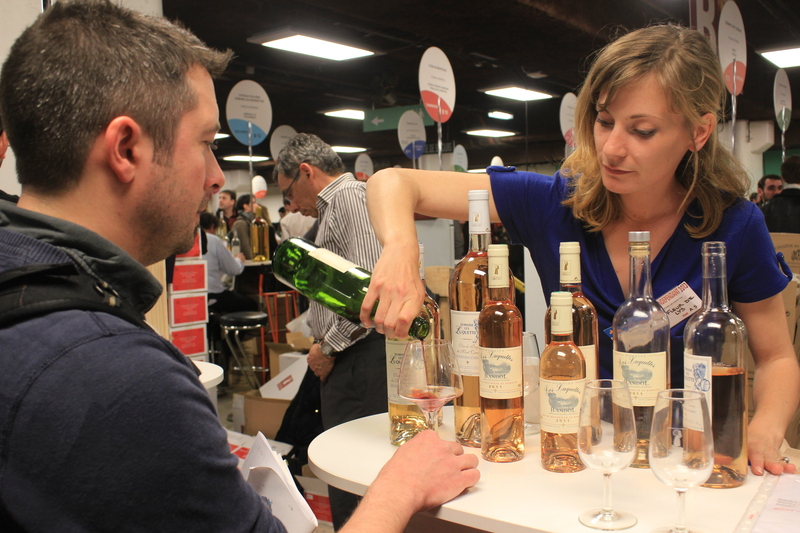 PS If you are interested in wine and are planning to come to Paris in the autumn or spring time, try to coincide your visit with one of the wine salons. It really is a lot of fun and provides an excellent way to learn more. And if you are just driving around France, do not be afraid to stop to buy wine directly from the producers. It is best to call in advance, but no one says you cannot stop by and ask if this is a good time to visit. Lastly, if you are interested in individual making of things, do not forget to do a little bit of research in order to find the logo of Vignerons Indépendants in the bottles you buy! This entry was posted in Uncategorized and tagged biodynamic wine, Catholicism, France, Languedoc-Roussillon, organic wine, Paris, wine on March 27, 2013 by Miia. I’m a huge fan of Le Salon des Vignerons Indépendants. We go to stock up on champagne – who can’t be happy about that! Bonjour Carina. Thank you for following my blog and also for writing me. Which Salon do you go to, the one in Paris? It is a pity it is not organized more often 🙂 PS Do you also sometimes drive to Champagne to buy directly from there? We recently visited a fantastic chateau that I will soon write about (Chateau d’Etoges).